So, I was just looking at Ballotpedia, and it looks like a wide open race. But the clear winner is this guy named Mr. Undecided, who has 53% of the vote. I mean, crap, more than half of (Dem primary) voters haven't decided yet. I mean, I get it, the primary isn't until the end of August, but still. ... huh, the footnote down below says only 41% were truly undecided, 12% picked Other (and other than John Morgan or Jeff Greene with 0%). I like Philip. He's that nice Jewish former mayor of Miami Beach, who always puts his Jewish mom in his ads. Good on climate change. I used to work for Gwen's dad, Bob Graham. Always was a fan of his. There's a personal connection. Gillum is the minority candidate. But as Mayor of Tally, I'm not sure if he's really had the statewide exposure. Dunno from Chris King. I guess he's popular with those so-called millennials. I think David Jolly and Patrick Murphy are still "exploring," not really caring if they've found what they're looking for (cue U2 song). Graham seems to be leading in national endorsements, but Levine is crushing her in fundraising. TAMPA, Fla. (WFLA) – A new poll released by Mason-Dixon Friday morning finds U.S. Rep. Ron DeSantis and former U.S. Rep. Gwen Graham as the current Republican and Democrat leaders in Florida’s race for governor. Republican Ron DeSantis has opened up a double digit lead in polling over Agriculture Secretary Adam Putnam. DeSantis currently leads Putnam with 41 percent to Putnam’s 29 percent in a poll of likely Republican voters. Putnam was previously in the lead. “It is likely that President Donald Trump’s endorsement of DeSantis is the driving factor behind the shift in the race,” according to Mason Dixon Poll analysts. On the Democratic side, attorney and former U.S. Rep. Gwen Graham holds a 9-point lead over her nearest democratic rival, former Miami Beach Mayor Phillip Levine. Graham leads with 27 percent among likely Democratic voters followed by Levine at 18 percent, businessman Jeff Greene at 12 percent, Tallahassee Mayor Andrew Gillum at 10 percent and businessman Chris King at 7 percent. Just want to remind any other folks in Florida (if there are any ) early voting for the primaries has started today. The actual primary election date is later this month, Tue the 28th. Fortunately, there probably won't be long lines (that's rare for primaries), but, hey, didn't want to risk it. The last "PPP" poll (8/6) is showing a closer race between Graham and Levine. Sorry Andrew Gillum fans ... "undecided" (19%) is beating him in the polls (13%). As is Jeff Greene (16%). You may have a primary for your congressional district. I didn't. hope you get some relief from what you got now it cant be easy I know. Well, I am hoping the undead infection of Rick Scott can be contained so it won't spread to Washington DC. But polls are occasionally showing him ahead of Nelson. Worrying. Nelson doesn't always have a challenging opponent, so his team better figure out how to deal with one. I'm hoping that moron on the R guv side who keeps showing ads where he's teaching his kids how to worship Trump ... urgle ... gets defeated. I like Philip Levine. Sorry to go Ikean, though, but will this Miami Beach Jewish mamala's boy play statewide? I have my doubts. I worked for Bob Graham and I've always liked him, so after some deliberation and consideration, I voted for Graham. Levine would have been my second choice, Gillum my third (if we did ranked choice voting ). No fondness for either King or latecomer Greene. I often pass by Bob Graham's office when I'm in Miami Lakes. I will campaign for either Levine or Graham if they win the primary, actively. We're lucky to get a Democrat to run against the Diaz-Balart infection in my district, and it's pretty rare to have a primary where two are going for it. I keep voting for the Dem in this district, and they keep losing. Mary Barzee Flores was going to have some primary opponents, but they dropped out. I hope she can beat Mario. Ballotopedia's showing no polls for this district, but Cook Report has it rated (pretty perennial, lots of Cuban American voters) R+4. How do you think turnout will be? Early voting turnout has been high. This could be a squeaker. The actual primary is Tuesday. August 22, 2018: An SEA Polling & Strategic Design survey found Philip Levine with 26 percent, Gwen Graham with 25 percent, Andrew Gillum with 18 percent, Jeff Greene with 13 percent, and Chris King with 2 percent. Fifteen percent of voters were undecided. So ... a slight edge to Philip Levine, but with 15 percent undecided ... that's a big swing vote. Gwen Graham just had a concert with her father Bob and Jimmy Buffett performing at Young Circle in Hollywood (FL). I considered going, had other stuff to do that day. I like both of them, I will for sure campaign for either in the general. Jeff Greene pledged to stop running negative TV ads, then took all of one day to change his mind. Looks like Andrew Gillum is making a surprise surge into second. A nail-biting two-way tie between Graham and GIllum, each with around 32%. Levine in third at 20%. I like all three, and was never crazy about Greene or King, so I don't mind watching them fade out. 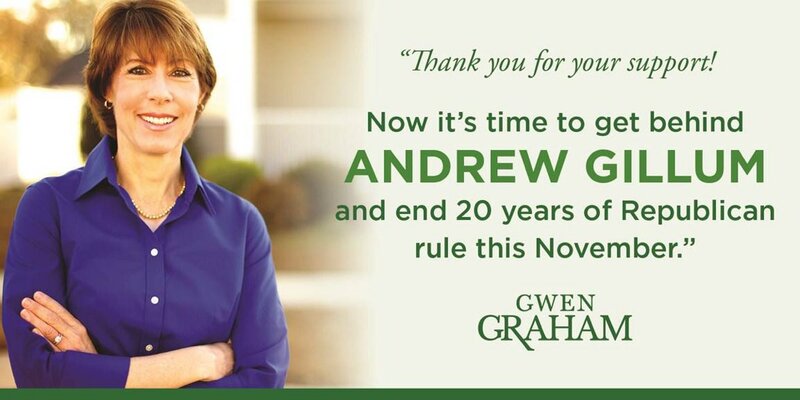 But it looks like it's going to be Graham or Gillum. All three have ties to this area: Graham's family is from Miami Lakes, Levine is from Miami Beach, Gillum is also originally from Miami Gardens, I believe. The race is called Gillum has won. I looked at his wiki page. He appears to be clean. Their wasn't a controversy or scandal section to read. I think he might be the kind of candidate who people get out and vote for, and that helps the down ballot democrats. It might help the US Senate candidate. There was an investigation into corruption, but nothing found to date. DeSantis will try and turn that nothing into something, I'm sure. Ok Andrew. Forward we go, it's time for you to be the next Democratic governor of Florida. Let's get this done. ... did really well in Broward and Miami-Dade. BTW, Broward is Debbie Wasserman-Schultz's home district. Good for you, Gwen. I never met you, but you do remind me of your father. That's a compliment, I worked for him. Avanti. Democrats, unite. We need to take back our state legislatures and governorships to end gerrymandering. Still quite low but better than usual. there is the potential for landslides in in the non voter pool when its like it is. .........An estimated 255,813 people in Broward voted, or better than 22 percent. That exceeds the 2014 primary turnout of a little less than 11 percent. Few problems were reported, Snipes said. Some people attempted to vote at early-voting locations, rather than their own precincts, for example. Turnout was also higher in Miami-Dade County than the last off-year primary. Turnout was at 21.3 percent. That compares favorably to the 14.4 percent turnout of 2014.
these elections will be won not by turning Democrats into Republicans or Republicans into Democrats but by turning the non-voter into a voter, tonight is proof of that. The young people are winning.